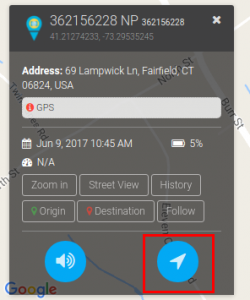 Upon clicking on the update location button (available for each device) Trackimo will attempt to contact the device through the cellular network and retrieve the device’s exact location. Trackimo will retrieve an exact GPS-based location, but if GPS is unavailable at the device location, Trackimo will attempt to approximate the location using the mobile network signals to the device. If the device is unreachable for 60 seconds during the location update process, the system will notify the user with an information notification. Reasons that the device may be unreachable may include; the device being turned off, the device is out of battery, and the device is in an area that does not have cell phone reception.